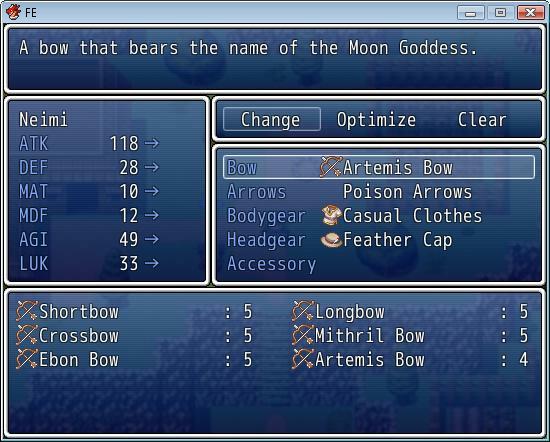 This script revises the way equipment slots are handled, as well as re-defining the built-in “equip type” system. You have full control over your equip slots and is not bound to the default slots. Define your own equip types. “Weapon” is too generic? Create equip types that reflect what your equip slot will take. Customize equip slots for each actor. This can be based on actor, or class, so that changing classes may result in different equip slots. You can have a limitless number of equip slots. Instructions are in the script. Setup your initial equips, according to your custom equip slots, using “w” for weapon, “a” for the armor, and the database ID. Use 0 if you don’t want anything in that slot. Setup your equip slots, providing regular and dual-wield slots. 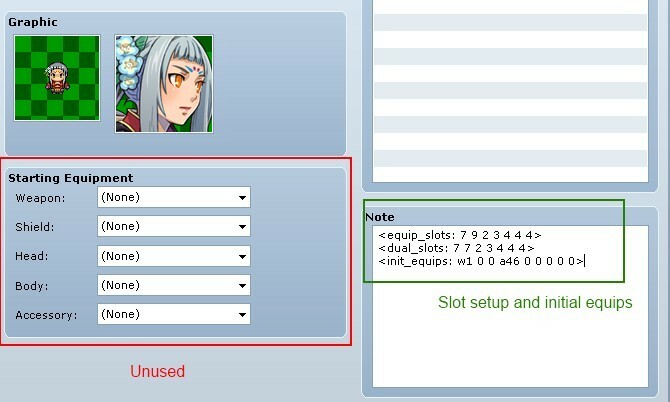 Can provide any number of slots based on equip type ID. Your actor must be able to equip a weapon/armor type in order to actually equip something, even if the equip slot allows you to equip it. Keep in mind that “equip type” is no longer used. You must change your armor database and set all of the armors to use an appropriate “armor type”. The error occurs when we put the "<dual_slots: 2 2 2 3 4>" (example) in the notes of the Actor. Entering the game, activate the "Dual Wield" and go to "Equipment", the error appears. http://grimoirecastle.wordpress.com/rgss3-scripts/gameplay-scripts/multiple-equipment-types/ is compatible with core Equip? It is possible to define the "types" to be used when a HERO IN PARTICULAR, using "Dual Wield"? It might be. I am currently in the process of uploading my own "multiple equip type" myself which is compatible with my script (but maybe not with other equip-related scripts). I&apos;m very interested, because this way, open space in order to create "master works". Leaving hands able to "Hands Free". Skill 1 = Enables use Sword one hand. Skill 4 = Enables use 2 swords 2 hands. Skill 8 = 1 Enables use of two hands shield + 1 Sword 2 hands. I think this fantastic idea because it develops a new dynamic to the game. Giving specific characteristics to each hero. But this is only possible with script. the "Equip Manage" was the closest I&apos;ve seen to achieve this goal. You can test whether 2-handed weapons work, since you would just seal the slots. This is a problem because if you have 2 main hand (2 slots for weapons) and block "Weapon" (as the base date), he locks the two slots. Arises to lock the "Shield", and he has two weapon slots, nothing will happen. Ideally you would have a "hands" slot that holds both shields and swords. If you are holding a two-handed weapon, it will lock all the slots. Yes, it would be ideal. 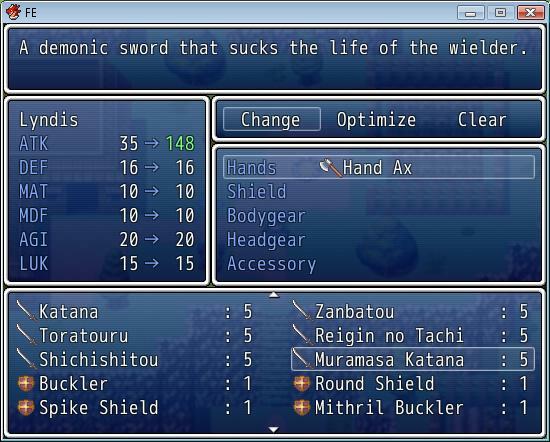 A command that define the weapon (or shield) as "<Two-Hand>"
It is very important to define "hero which uses what." 0 = Shield, Dagger, etc. ..
No, I&apos;m not updating the equip manager. It is not supported. Is there any script currently in development? I am not sure how you would specify whether you are using an actor’s equip slots or its class equip slots. It would be great if you could do something about this. Anyway, great script, and thanks. The notetag works for actors, but not for classes. Verify that Yanfly’s equip script and my equip manager are incompatible by creating a new project with only those two scripts. I have no issues with them together. Happens in a clean project, with just the equip manager added. It only happens with dual-wielder. I’ve updated the script. Maybe it will resolve the issue. Script ‘Equip Manager’ line 187: NoMethodError occurred. I will need more information on how to reproduce it.